Articulate Noise Books, 9781945441004, 200pp. 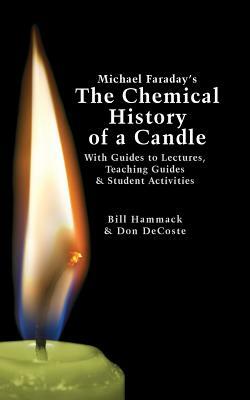 This book introduces modern readers to Michael Faraday's great nineteenth-century lectures on The Chemical History of a Candle. This edition is a companion book to the popular EngineerGuy YouTube series of the lectures. This books contains supplemental material to help readers appreciate Faraday's key insight that "there is no more open door by which you can enter into the study of science than by considering the physical phenomena of a candle." Through a careful examination of a burning candle, Faraday's lectures introduce readers to the concepts of mass, density, heat conduction, capillary action, and convection currents. They demonstrate the difference between chemical and physical processes, such as melting, vaporization, incandescence, and all types of combustion. And the lectures reveal the properties of hydrogen, oxygen, nitrogen, and carbon dioxide, including their relative masses and the makeup of the atmosphere. The lectures wrap up with a grand, and startling, analogy: by understanding the chemical behavior of a candle the reader can grasp the basics of respiration. To help readers understand Faraday's key points this book has an "Essential Background" section that explains in modern terms how a candle works, introductory guides for each lecture written in contemporary language, and seven student activities with teaching guides. Bill Hammack is a Professor of Chemical & Biomolecular Engineering at the University of Illinois-Urbana, where he focuses on educating the public about engineering and science. He is the creator and host of the popular YouTube channel engineerguyvideo. His outreach work has been recognized by The National Association of Science Writer's Science in Society Award; the American Chemical Society's Grady-Stack Medal, and the American Institute of Physics' Science Writing Award. His other books include Why Engineers Need to Grow a Long Tail (2011), How Engineers Create the World (2012), Eight Amazing Engineering Stories (2012), and Albert Michelson's Harmonic Analyzer (2014). Don DeCoste is a Specialist in Education in the Department of Chemistry at the University of Illinois-Urbana, where he teaches freshmen and pre-service high school chemistry teachers. He has received the LAS Award for Excellence in Undergraduate Teaching, the Provost's Excellence in Undergraduate Teaching Award, and the School of Chemical Sciences teaching award (four times). He is the co-author of four chemistry textbooks.